St. John Vianney High School catcher Andrew Keck caught all seven innings pitcher Luke Mann threw in a game against De Smet Jesuit High School. Keck, who entered the Catholic Church at the Easter Vigil this year, is a leader for Vianney’s baseball team. The chapel at St. John Vianney High School was packed with close to 200 people for the Easter Vigil, including a number of the baseball players who came to support their teammate who was baptized, confirmed and received the Eucharist for the first time. Andrew Keck, a catcher on the baseball team who was named to the All Metro Team last season, said around Lent every year he had thought about becoming a Catholic. His mom was raised Catholic, he said, and didn’t have him baptized, wanting him to make the decision on his own. Keck attended a public grade school and didn’t know much about the Catholic faith upon coming to Vianney, considering himself a Christian, however. “Vianney really opened my eyes,” he said. He’d considered taking the step toward becoming Catholic but was unsure if it was right at a young age and while he was so busy. 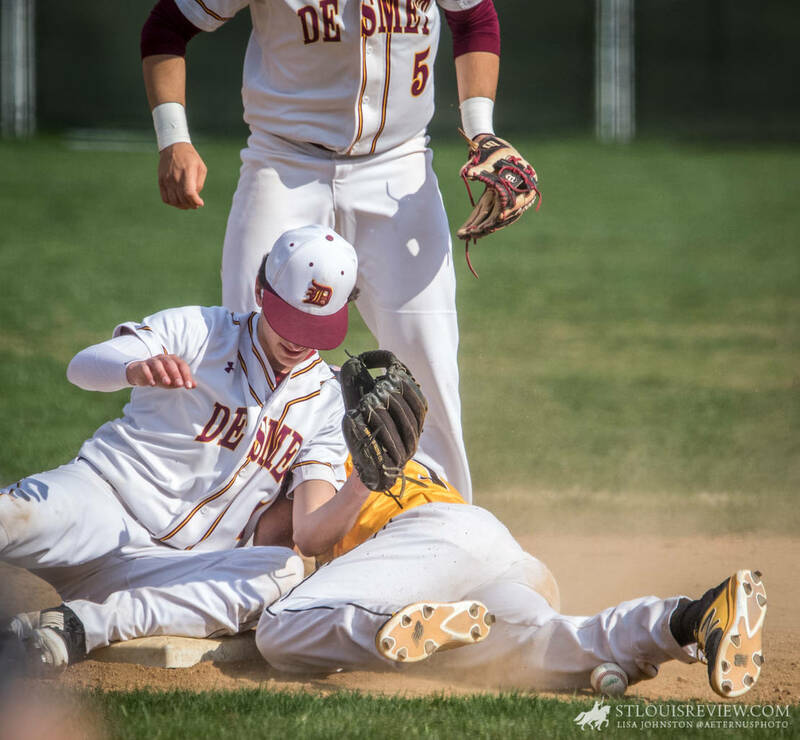 De Smet Jesuit High School shortstop JT Mabry collided with sliding Devin Ward from St. John Vianney High School. Vianney beat DeSmet Jesuit 4-1 to improve to 24-1 on the season. In the end, Keck analyzes it as a calling. “I wanted to be a part of a community that was bigger than me. I am at a point in my life right now where I’m as strong in my faith as I’ve ever been, and it’s awesome,” Keck said. Previously he’d go to various churches and wouldn’t take Communion. Vianney varsity baseball coach Scott Brown said his team was in a tournament that had been rescheduled for Good Friday. That morning, he had a campus minister at Vianney lead his team in the Stations of the Cross. They talked about the commitment Keck was making the next day. Brown was impressed by the number of players who attended the Easter Vigil Mass. Two of Keck’s teammates were his sponsors. St. John Vianney pitcher Luke Mann threw seven innings, giving up 5 hits and one earned run with 9 strike outs to help the team beat DeSmet Jesuit 4-1. Keck’s team is on a roll this year following a third-place finish in the state tournament with several juniors in key positions. Those seniors now are providing leadership focusing on each game with an eye toward a strong finish to the season. As a catcher, Keck enjoys being a captain on the field, setting up his teammates for success, especially helping the pitchers. He said he uses the adversity he’s faced in the past to be a better player today. 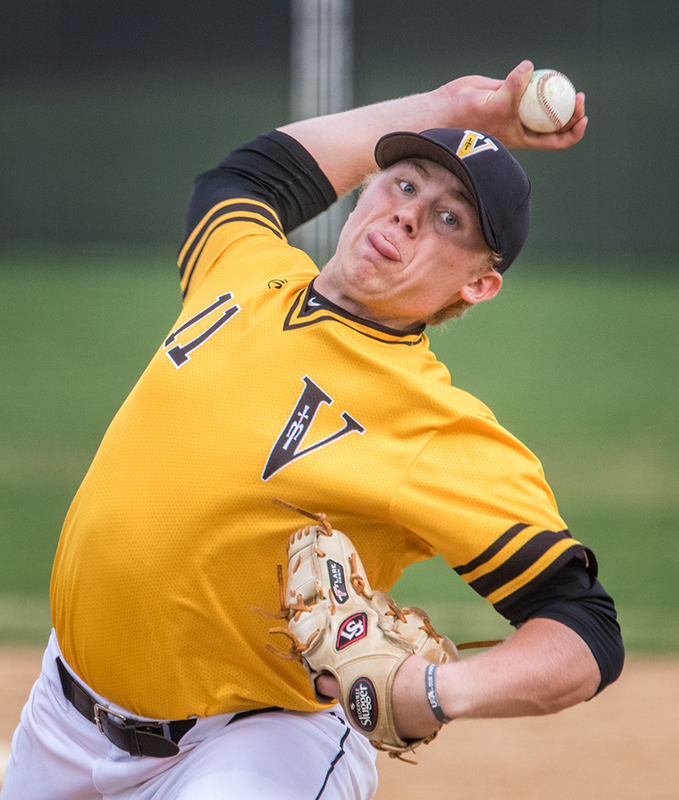 Vianney’s pitching and defense has held strong in a long string of wins this season. A big comeback against Parkway South when down 8-1 after four innings was an example of the team’s resilience, and a pickoff play and keeping runners from scoring on a hit by St. Louis University High School were examples of the plays that bring wins in big games, the coach said. In a game April 24 against De Smet Jesuit High School, Keck showed his defensive skill as he ably blocked pitches in the dirt and jumped from his catching position to snare a pop-up down the third-base line. Keck will continue playing baseball at Southeast Missouri State University.